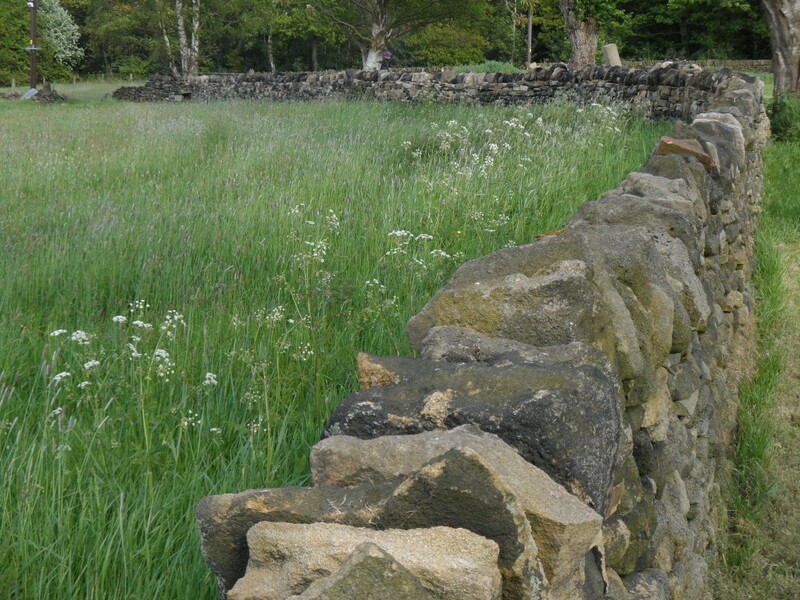 There is a dry stone wall between the orchard and the top field. 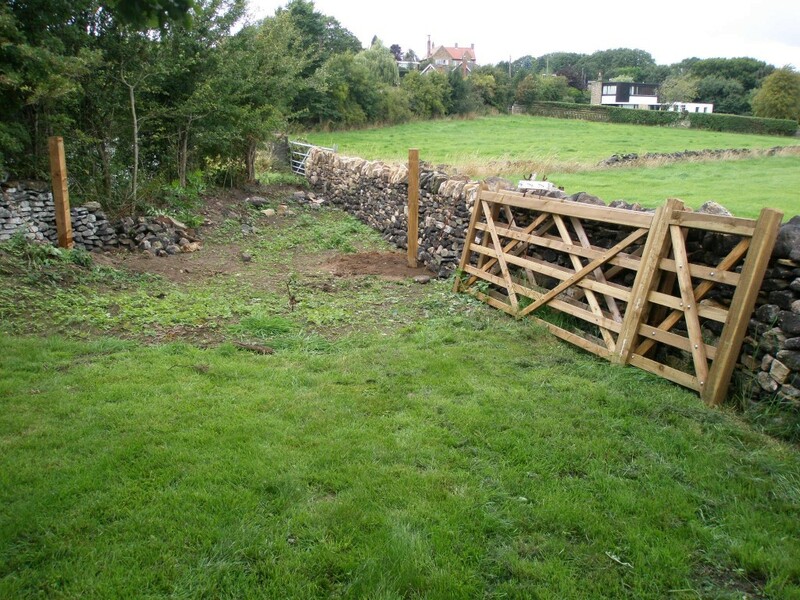 There has been a gap in it for a while – where we didn’t quite join the new dry stone wall to the orchard wall. We have decided to close this gap and make a proper one a little further along the wall. 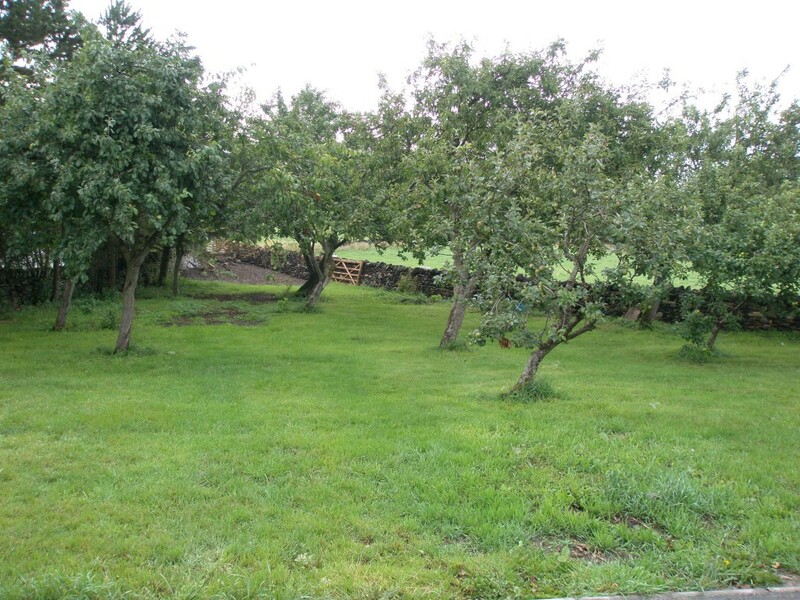 The ground level in the top field and the orchard is slightly different, so there will be a step down into the orchard. Fortunately, we had a piece of ashlar left over from the renovation. No one can remember why it was ordered, but it seems to fit here a treat. The step is level – honest. We used a spirit level on it. 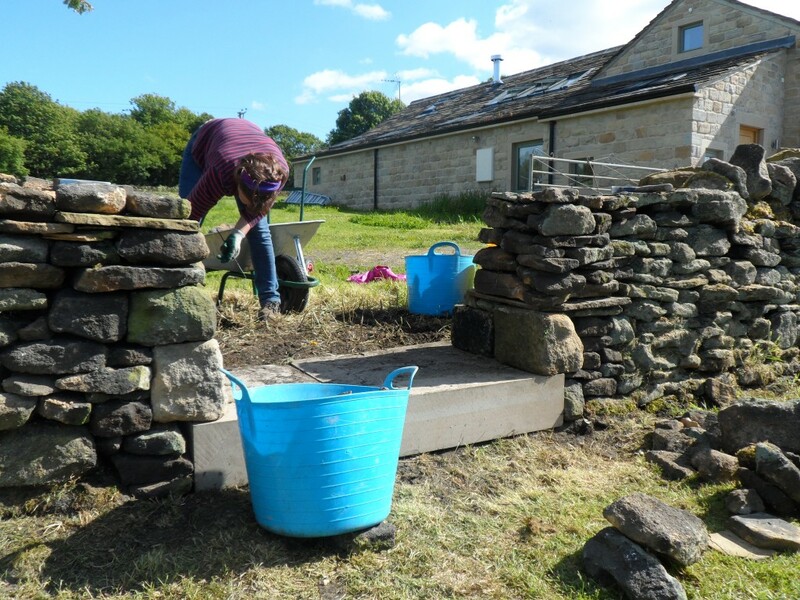 There are a couple of flagstones at the back to increase the width of the step. You can see that we have started to build up the left handside. We have overlapped the wall onto the step to make it all a little more robust. The left hand side has now been built up. Like the walls themselves, the end leans back as it is a more stable structure. We used some big stones out of the old barn directly on top of the step. Both sides of the new opening have been built up. The next job was to make sure that the top of the wall was level – both sides of the opening – before putting the coping stones on. 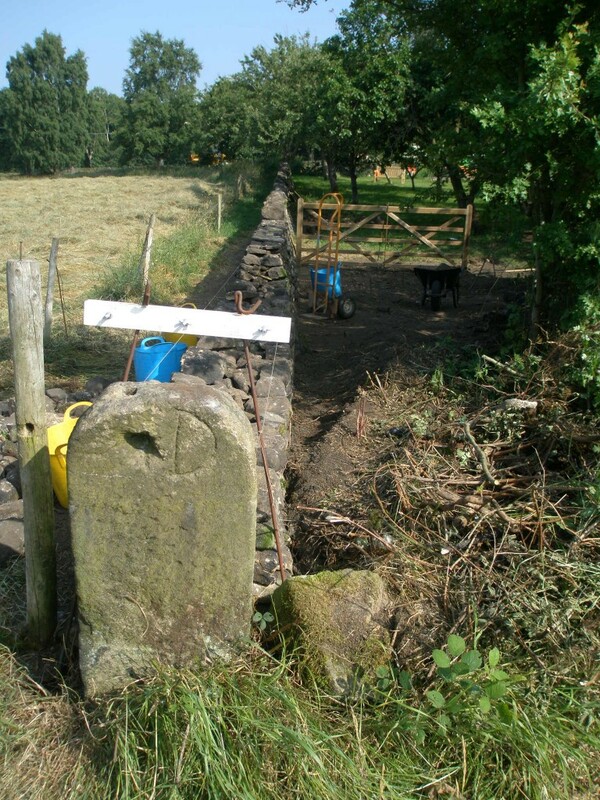 Well, after 2.5 years we have managed to finish the dry stone wall along the side of the orchard and the top field. 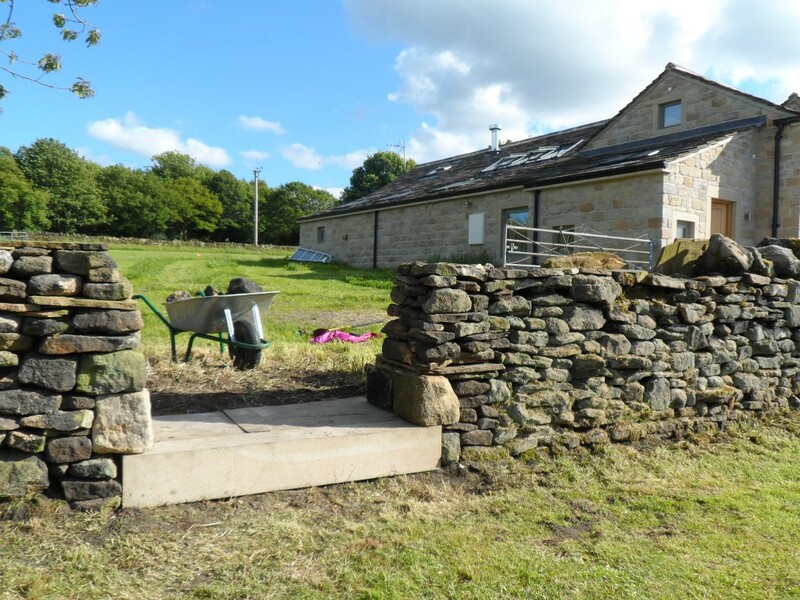 It was November 2012 when I finished building the first bit of “test” wall – I did this after attending a weekend dry stone walling course. 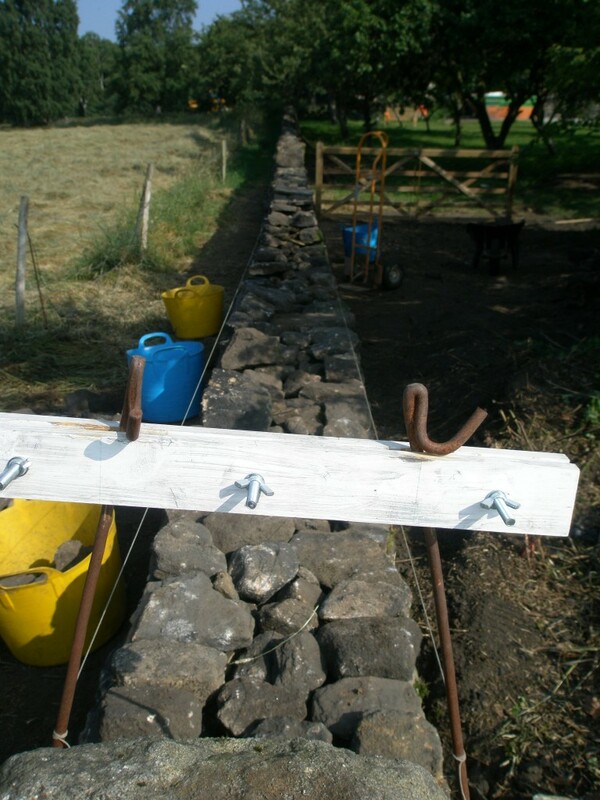 I did keep a record of how many days that we spent dry stone walling, but lost count at around 20. I suspect that we have spent between 50-60 days over the last couple of years rebuilding this wall. We have worked on other walls around the property during this time as well as building the retaining walls in the patio, so we haven’t been doing nothing. The finished wall is around 110m in length. 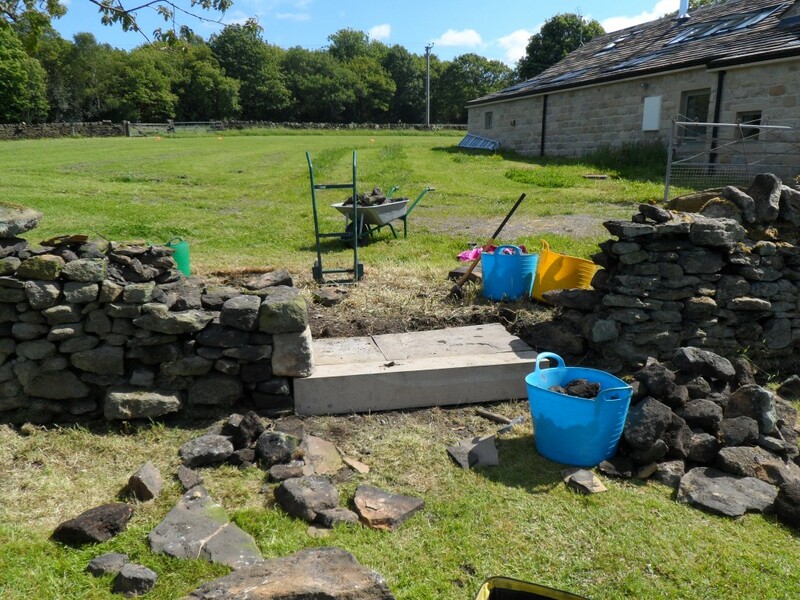 The wall was in pretty bad shape when we started the project and the vast majority of it has been taken down and totally rebuilt – we have only managed to keep around 3-4 metres of the original wall. 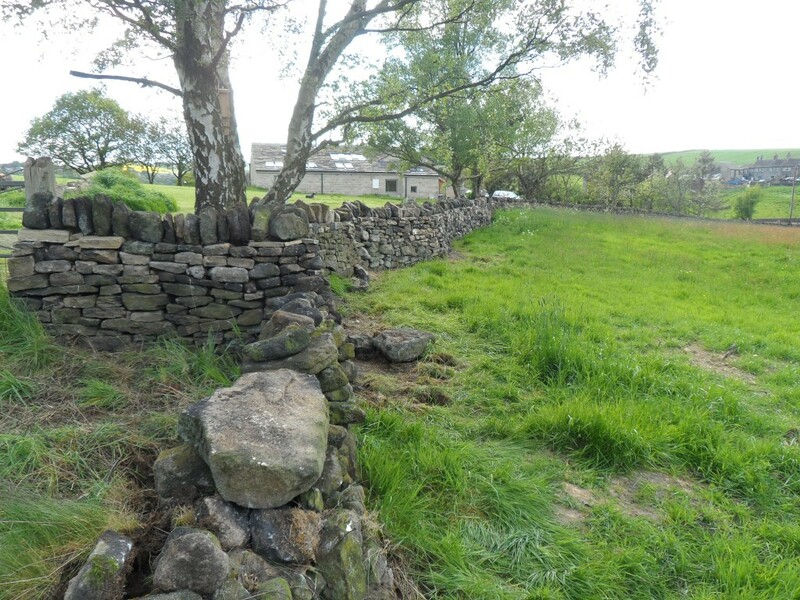 The wall isn’t perfect, but then dry stone walls never are! They are a reflection of the quality of the stone that goes into it. 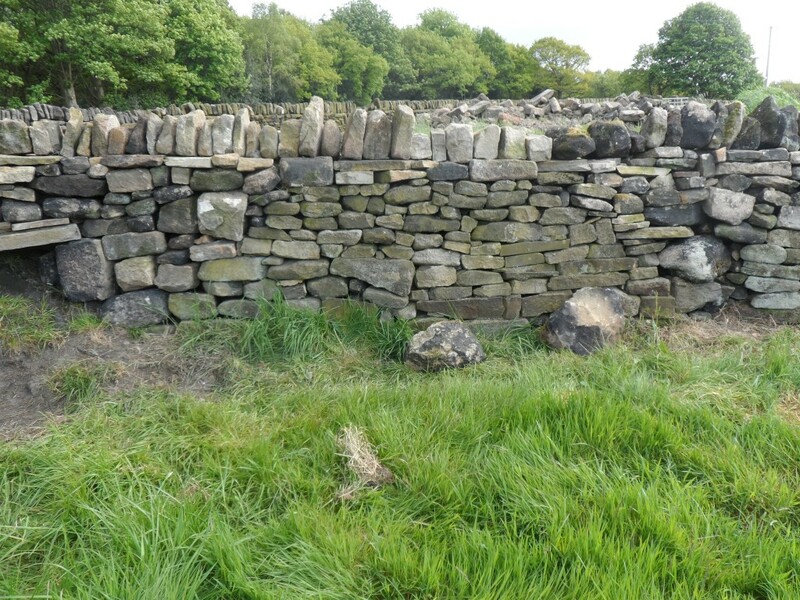 This wall contains the well rounded gritstone that made up the field boundaries, but now contains additional stone left over from the building work or some of the demolitions. While the wall in the orchard is largely straight, the one along the side of the top field has quite a few wiggles in it – mainly due to trees. 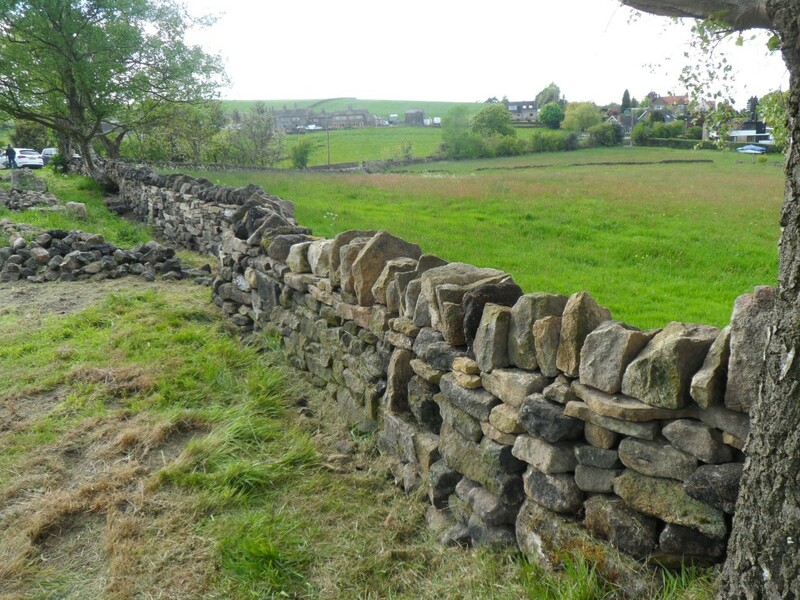 We still have some stone left over from the building work, so I suspect there is some more dry stone walling to come. It is just over 110 metres from the gate around to the far Ash tree in the distance. It is just over 110 metres in length and the original “test section” of wall is in the far distance next to the furthest tree. With each metre of wall containing around 1 tonne of stone, this has been a bit of a labour of love over the last couple of years. The fields on this side of the wall don’t belong to us so for now we have just had a bit of a tidy up. You can see the wiggles on both sides of the wall. Plus we also have a fair amount of stone to move before we can start mowing right up to this wall. The bit of wall to the right of the original test section (it is a slightly paler colour) looks a bit of a mess! I think I might have to have a go at rebuilding that bit. If only for vanity’s sake. Now we have re-seeded the top field, we seem to have an awful lot of grass to cut! The bottom field has always been a bit of a challenge – it is fairly lumpy and has quite a slope to it. We have ended up borrowing a tractor and topper a couple of times a year, but this means that the grass only gets cut when it is 4ft high. The topper ends up flattening more grass than it really cuts. The top field is fairly flat with some good grass on it. It was only sown about 6-7 weeks ago, so it will be next year before it fully thickens out. These two fields are about an acre each. Then we have the orchard which is full of trees and the occasional tree stump. Up until now we have been using a mulching mower to cope with the grass in the orchard, but now with the top field re-seeded we have decided that it is time to invest in a ride on mower. Once we have a mower of our own (rather than having to borrow one), we suspect that the grass will get cut a little more often. After quite a bit of research, we decided to invest in a zero turn mower. We haven’t been very impressed with the tractor and topper – it feels very unstable on the slope in the bottom field and the quality of the cut has been pretty poor. 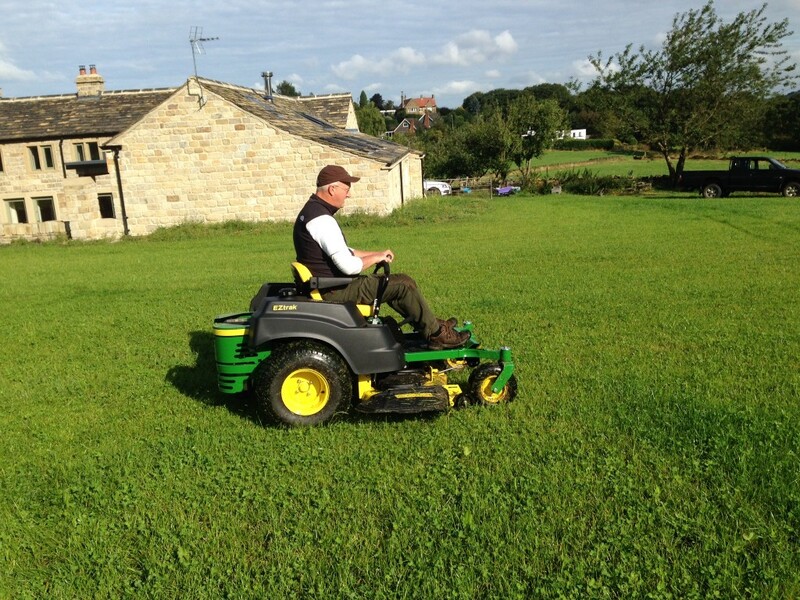 While a zero turn mower is going to be less versatile than a compact tractor, it is going to be quicker and make a better job of cutting the grass. It is also going to be a cheaper option. We had a good look around and ended up on deciding on a John Deere Z425. Although John Deere kit is expensive, it is very well made and should cope well with the size of area that we are cutting. We have always opted for slightly more commercial equipment because of the size of the property. We arranged for a demonstration through our local dealer (Bob Wild in Hebden Bridge) and were so convinced by the machine that we decided to buy it there and then. Over the weekend we have cut the grass in the bottom field a couple of times. We have raked the grass in-between each cut (don’t forget it was 4ft high a couple of weeks ago) and hope that we will get this into a decent state before the summer is out. 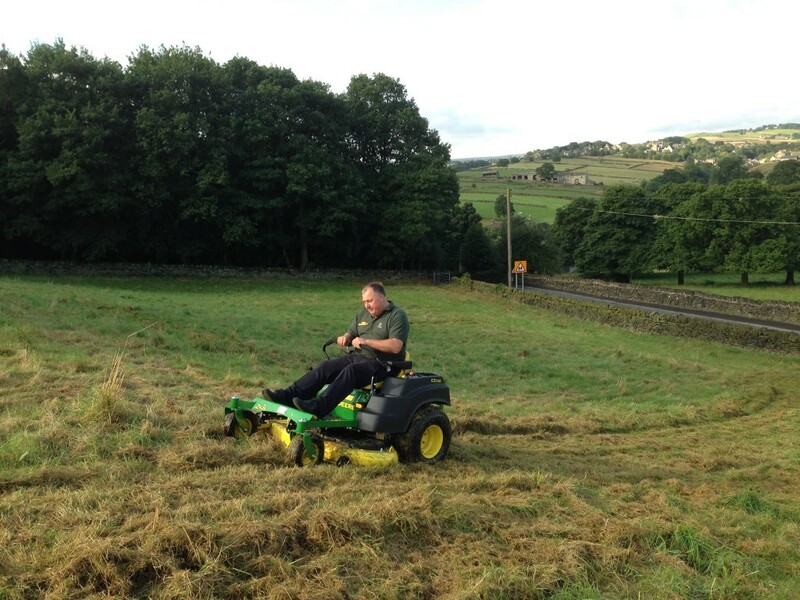 Adrian from Bob Wild Grass Machinery demonstrating the John Deere Z425 on the slope in the bottom field. This machine is a lot more stable (and a lot quicker) than a compact tractor and topper. Adrian actually demonstrated that it is possible to cut along the slope with this machine. The slope doesn’t look much in these photos, but it feels steep when you are on it! If Daleks could mow grass, this is what it would look like! It feels a bit like driving a large motorised wheelchair. We need to shoot some video and post it. We cleared as much of the tree that was damaged in the weekend storms as we could, however, our chainsaw wasn’t really up to the job. 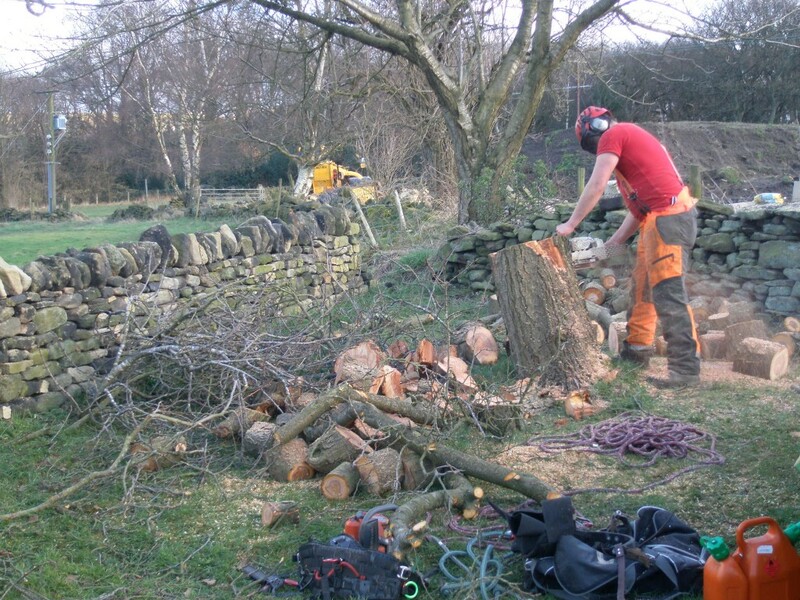 Chris LeRoy kindly dropped by today to sort out the bigger parts of the tree that were still standing. My 14 inch chainsaw just wasn’t man enough to deal with this tree. 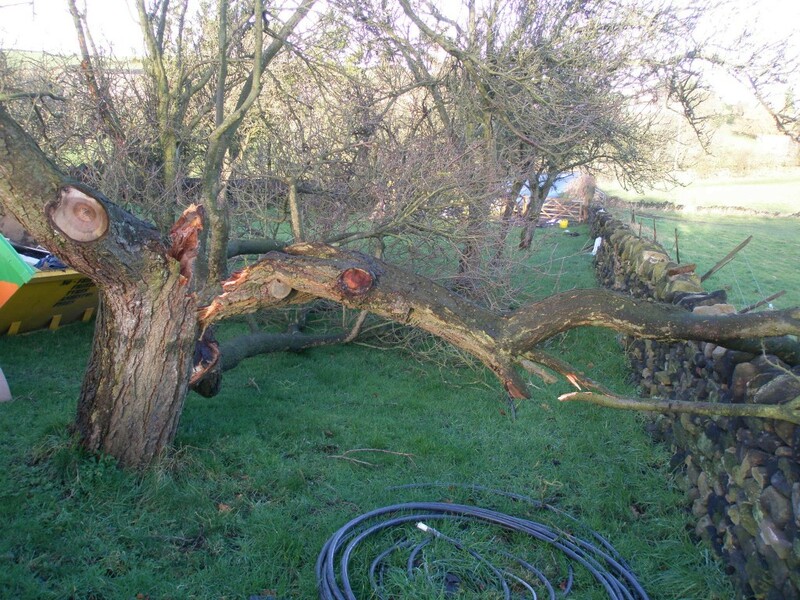 Chris LeRoy – our local tree surgeon – happily (and very carefully) dealt with what was left. He logged all of the big wood for us so that it can be easily chopped into logs for the fire. This just needs to be split and stored for the next 9-12 months before we can burn it on the log fires! It looks as if it was an old apple tree. However, in the last couple of years we have seen no fruit on it. Although the house is fine, we did lose one of the bigger trees in the orchard yesterday afternoon. I suspect we were actually around when it fell down, but we didn’t hear it. We waited until the wind died down before attempting to clear the debris. 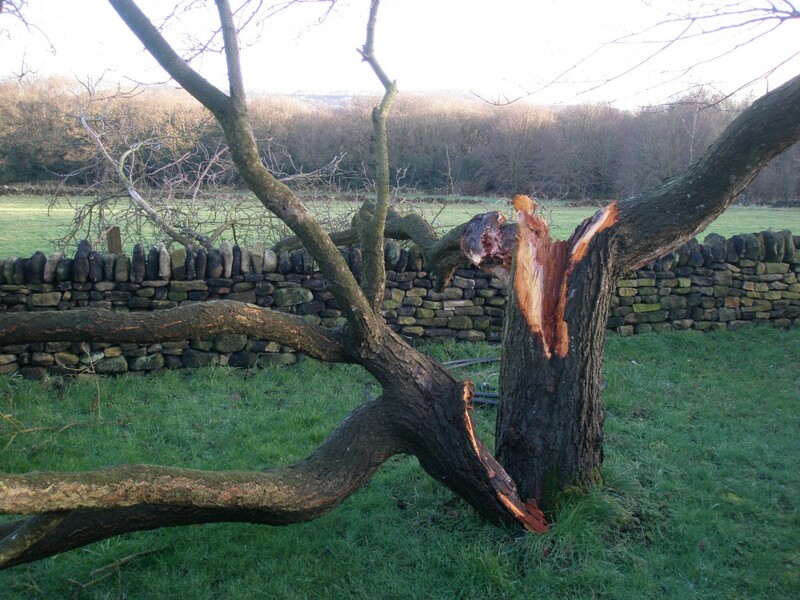 Our chainsaw managed to cut through all but the largest branches – I suspect that we will have to get our friendly tree surgeon to deal with these. The smaller branches will go on a bonfire. The larger ones have been cut up into firewood. It will be around 12 months before these are dry enough to burn. We the storms yesterday afternoon, we lost one of the trees in the orchard. This was a particularly large treee, so it was even more disappointing to lose it. However, it was pretty rotten inside and this wasn’t the first time that it had lost some of it’s bigger branches in the wind. 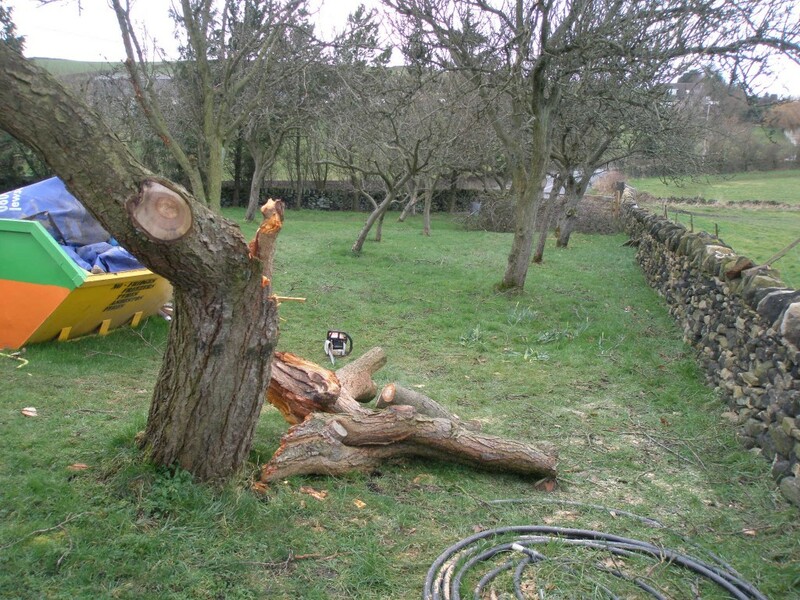 One of the larger branches fell and hit the dry stone wall that we built last year. Another ended up in the skip. 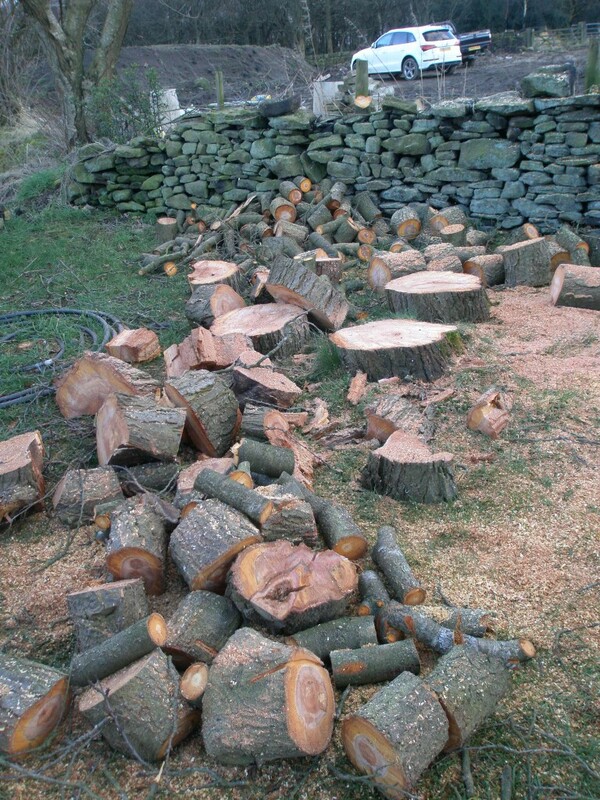 It didn’t take long with the chainsaw to cut up the smaller branches and then cut the larger ones into logs. Unfortunately, some of the bigger bits are jsut too big for my chainsaw. 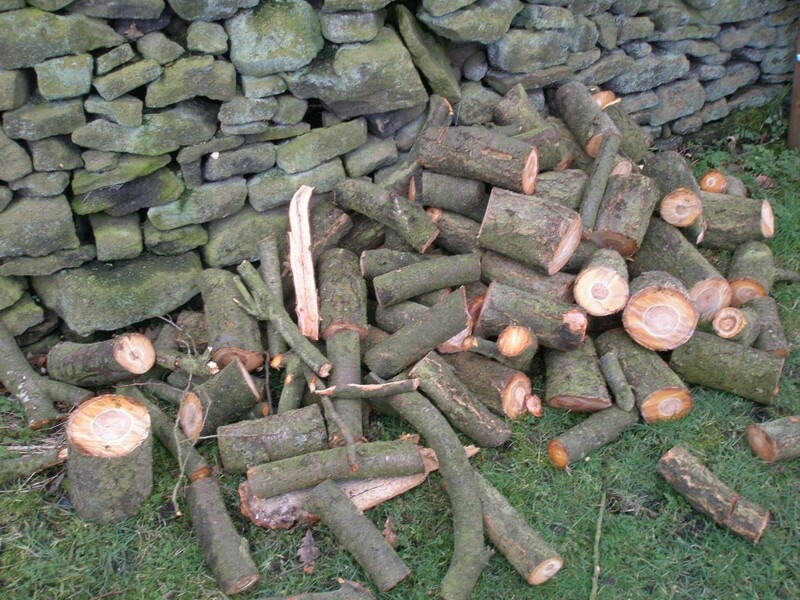 I cut up the larger branches into logs for the fire. These will have to dry out before we can burn them, but they should be ready to burn by the end of the year. Friends came over at the weekend and brought with them an olive tree for the garden. It needs (apparently) to harden up in the polytunnel before being planted out. Many thanks to Diane and Steve – next time you come over, I hope that you will be able to stay in the new house! 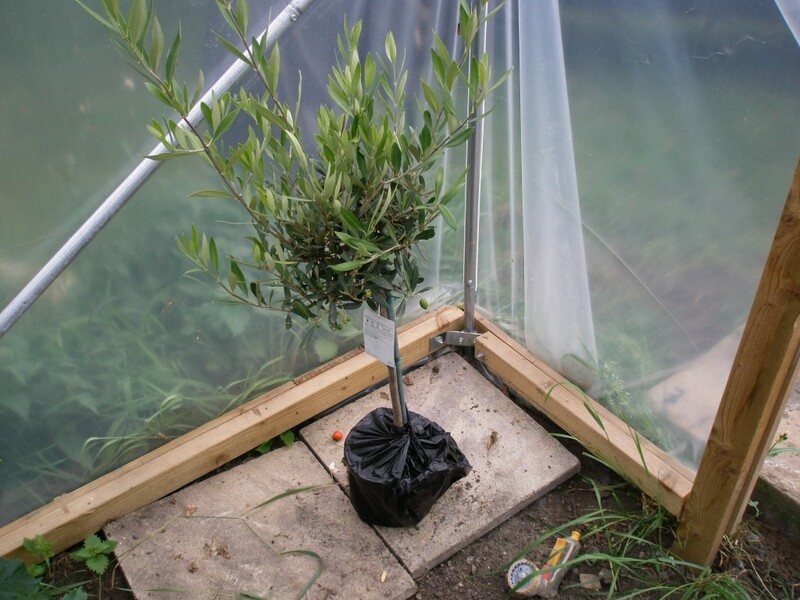 The new olive tree needs to harden up in the polytunnel before we decide where to plant it. 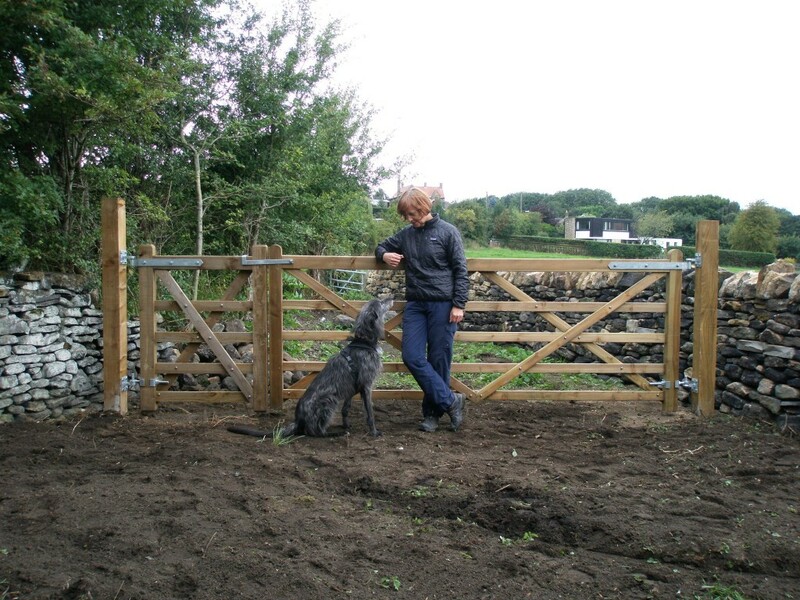 Having put the gate posts up yesterday, today it was time to install the gates. The brackets were a bit of a fiddle, but once adjusted, looked pretty good. Even the spirit level seem to like them! 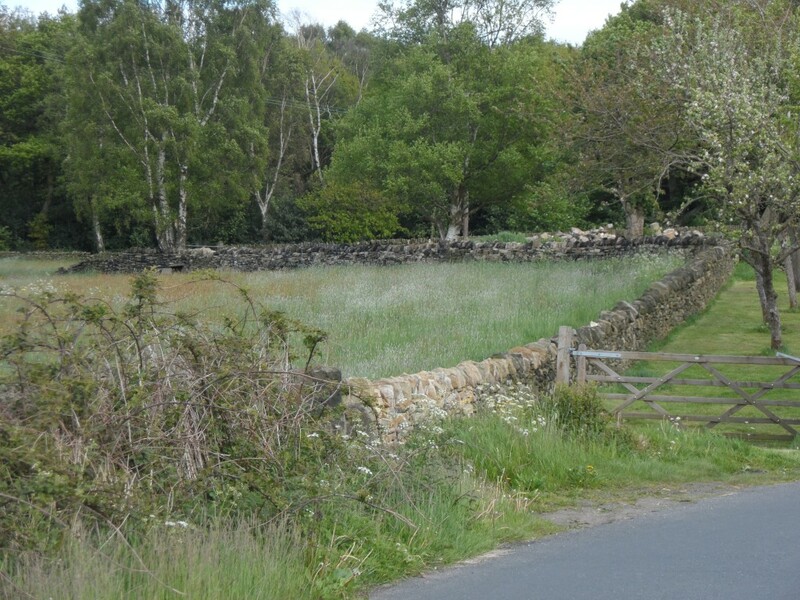 The next stage is to build up the dry stone wall along the roadside to meet the gate post. Then we can take the trees down to reveal the entrance. All of the hardware for the gates is from Earnshaw’s in Midgley. It isn’t cheap, but it does a great job. Jo and Zep helped. It was Zep’s 9th birthday today! We have installed two gate posts in the orchard. 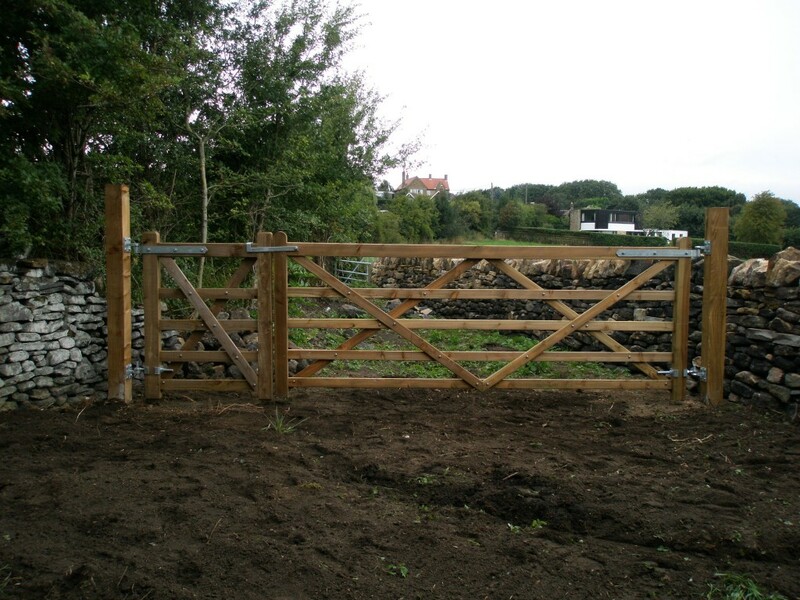 These have been installed so that they fit two gates – a 10ft gate and a 3ft gate personnel gate. Longer term, these will be used as as the main entrance to the property. 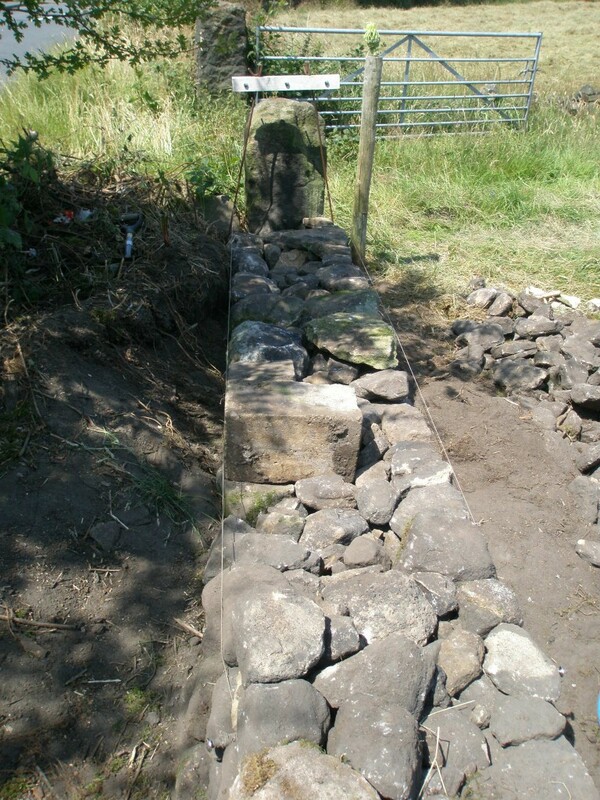 Once the gates are installed, we will repair the dry stone wall along the roadside to fit with the new gate post. We dug the holes for the gate posts today. One was easy, the other had some large stone in it, but this was soon dealt with! A combination of some great weather recently followed by some wet weather has really brought the orchard to life. I mow the grass on average around once a week and slowly the quality of the grass seems to be improving. It doesn’t take long. Around 30 minutes. Much of this is down to it being a mulching mower so there is no grass to collect. I try to cut the grass just before it rains as this helps the clippings rot down a little quicker. The trees are doing well too. There is a lot of fruit on the trees, particularly those that I pruned back last year. Surprising since I didn’t really know what I was doing at the time. Our lone pear tree has no pears. But there again, it was one of the trees that I didn’t cut back. A combination of some very hot weather followed by some very wet weather has really brought the orchard to life. Bizarrely, the trees that I heavily pruned last year seem to have the most fruit on them. 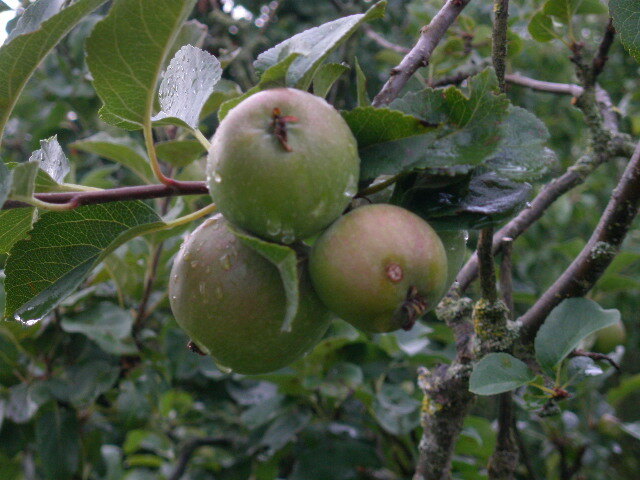 There are mainly apple trees, but lots of different varieties. 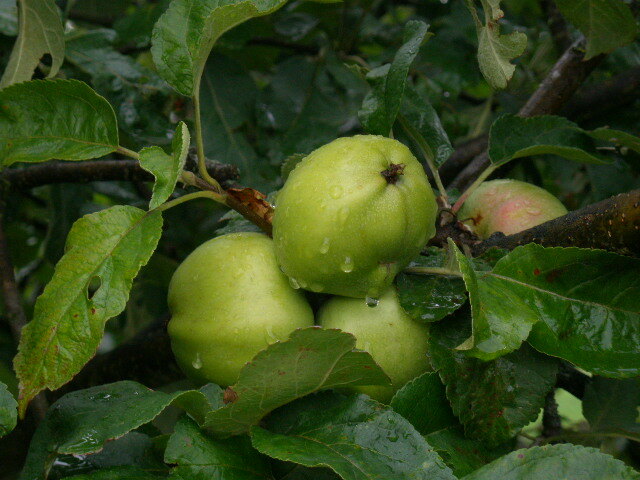 More apples, but from a slightly older tree. I don’t know what it is, but it definitely isn’t an apple. And you never realised that I wasn’t a gardener! 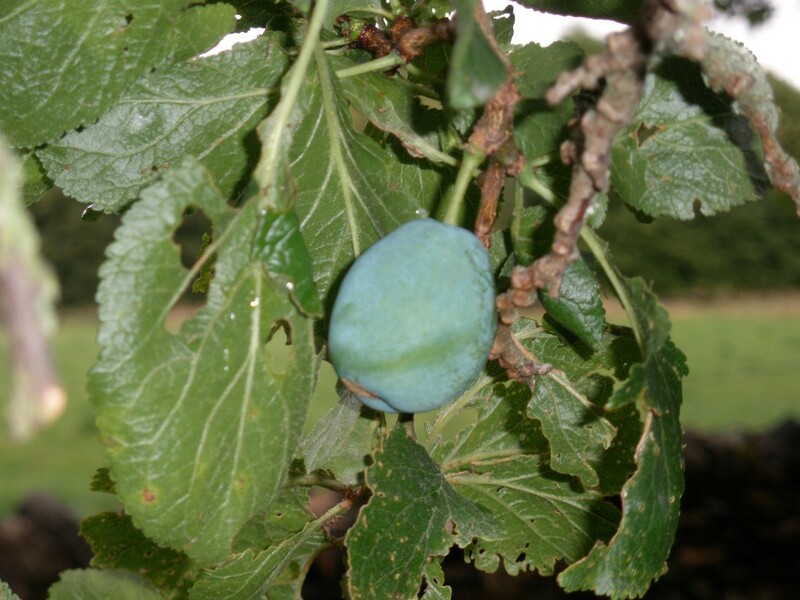 I think it is a damson. But it could be a plum. 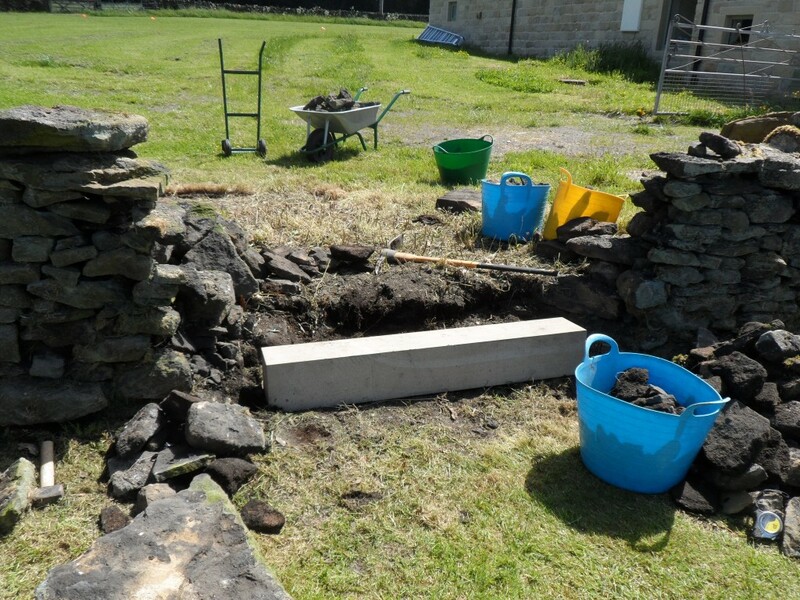 Yesterday we dug out the last section of wall to reach the stone gate post in the adjoining field. We made good progress building up the wall and I reckon that we will be all finished in the next couple of working days. The main challenge is that we are likely to run a little short on stone for the wall. We do have some surplus stone elsewhere on site, so we are going to need to sift through the various piles on site to find suitable stone. 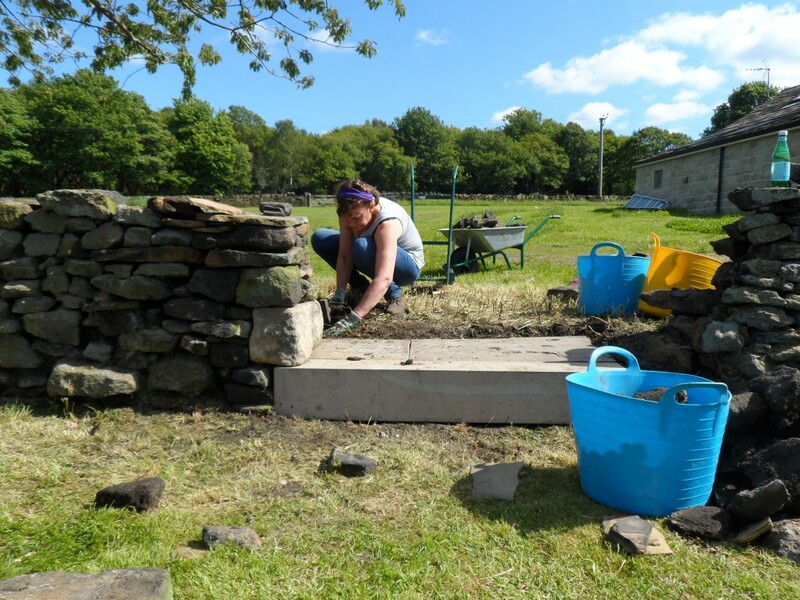 The gatepost for the adjoining field is in the foreground (no idea why there is a letter “D” on the gatepost) and there is probably only a couple of days work left to finish off the wall.